CHOOSE IT AS: A large cooking area will offer you adequate space that can sustain your needs for all kinds of grilling. - It weighs just 24 lbs with dimensions of 23" x 15" x 4 " which is both manageable and sizeable enough to make a good indoor grill. - It comes with a cooking area of 155 inches that will offer you adequate space that can sustain your needs for all kinds of grilling. - It's lid is oval shaped and has a standard lock that is common to outdoor electric grills. A deliberate design that gives it some touch of sleekness and elegance. - The electric bbq grill is quite modern with controls that can be adjusted through the use of touch. A key thing that will enable you to operate the indoor grill in both speed and efficiency. - The material that has been used to make the electric grill is stainless steel. A common feature in the best electric grills.This material is very key as it is anti-rust and so gives the grill an edge when it comes to durability. When it comes to an electric bbq grill, especially those that are programmed to heat up quickly, it is so easy to end up messing your food. For this reason, any grill that will qualify as the best electric grill should come with features that help you overcome this problem. I love this Kenyon B70086 grill because it comes with good touch controls that you can use to adjust your settings to prevent the incident outlined above. Thus adjusting of the settings on your grill have been made fast and much more efficient with this indoor grill. This electric bbq grill can heat up to very high temperatures within a matter of minutes. It is therefore important that it is fitted with safety measures to prevent this heat from coming into contact with anyone, especially curious kids.The manufacturer has thus designed it in a way that the heating elements are totally concealed and cannot cause harm easily. Thus, you can leave your grill unattended to while you focus on other things without the worry of harm being caused to any of your family members. It is expected that meat can get quite messy when you are doing some grilling. This can make you spend a lot of time with the cleaning afterwards. But with this grill, you do not need to worry about that as it comes with grates made of non stick material. This feature will ensure that you can easily clean off the grease out of the grates after you are done with the grilling itself. And especially considering the fact that it is designed in such a way that you can remove the grates from the electric bbq grill and wash them in a dishwasher. A major problem that people who love to grill have faced in the past and even today is outdoor electric grills that have elements that rust. It was common especially with the old school non-electric grills. However, one thing that stood out for me with this electric grill is that all the metallic elements are made of stainless steel which cannot be affected by rust. So you can use this grill assured of no rust which can be very dangerous to you in the long term if ingested. One of the problems you expect to encounter with outdoor electric grills is usually grease flare ups and smoke which can be quite messy. To overcome this quite annoying challenge, this electric grill is made up of concealed electric elements which go a long way in preventing the flare ups from happening. In connection with the messy grease, the grill also has this disposable grease trays which is one of a kind compared to other grills in the market today. It will save you a lot of time when it comes to cleaning. You also want a electric grill that can achieve your optimal temperatures within a short period. This grill is modelled to achieve temperatures of 600 F within a span of ten minutes. This is a time saving Feature that can be very helpful when you want to do some grilling very fast. I also admire the fact that the grill comes with an insulated lid that can be removed for cleaning. This feature is quite crucial to ensure it is easy to clean both the lid and other parts of the outdoor electric grill so that it does not end up looking messy after use. The only notable concern that I picked about this product is that its rounded edges begin to wear off after the first year of use. Though this is not that of a major concern, I feel it knocks off a few points off the product's durability and its possible position as the best electric grill. This is one indoor grill that will satisfy your needs by a very big margin given the benefits that come with its features. The touch controls will definitely appeal to you as they boost the efficiency of your grilling process. 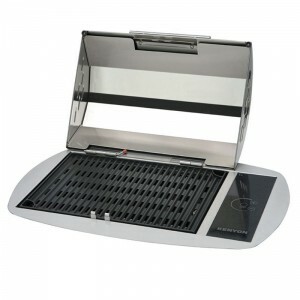 You can expect to have an easy cleaning time given the non stick grates and the removable lid that you can detach to access other areas of the grill. And expect not to experience any grease flare ups and any irritating smoke while doing your grilling. But you should know that it has one drawback; its rounded edges that wear off quite fast. As much as this might be an issue, it is minor compared to the benefits, therefore I recommend this electric grill. Rounded edges wear off quite fast.